US consumer confidence (discussed here) may end up being somewhat better than initially thought. The sentiment figures from the University of Michigan (as opposed to the Conference Board measure) actually improved in August, though remain below the pre-recession average. Bloomberg/BW: - Consumer confidence improved more than projected in August as merchant discounts and record-low interest rates help U.S. households bolster finances. The Thomson Reuters/University of Michigan final sentiment index climbed to 74.3, a three-month high, from 72.3 in July. The gauge averaged 89 in the five years leading up to the recession. If consumer spending is any indication of confidence, the U Michigan numbers may be closer to reality (see this discussion comparing the two sentiment indicators). US chain store sales figures for August have been surprisingly robust. ICSC: - The preliminary tally of major chain store sales for August (fiscal month ending August 25) is up 6.0% (less drug stores) and appreciably above the 4.6% comp-store pace for July. Comments about back-to-school sales are generally favorable. The August growth rate is the strongest reading since March 2012 (+6.8%). The broader gauge of consumer spending from the Commerce Department looks to be reasonably strong as well. Reuters: - U.S. consumer spending got off to a fairly firm start in the third quarter, rising by the most in five months and offering hope economic growth would pick up this quarter. ... The Commerce Department said consumer spending increased 0.4 percent in July after a flat reading in June. US consumers remain uncertain about the future yet seem to have a healthy appetite for shopping. 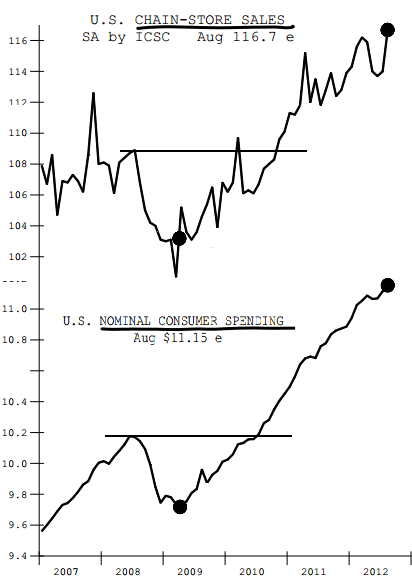 Consumer spending has improved materially since the recession. This is fairly good news for the US economy, but let's hope that rising food and energy prices (especially if exacerbated by the US monetary policy) don't bring consumer spending to a grinding halt.